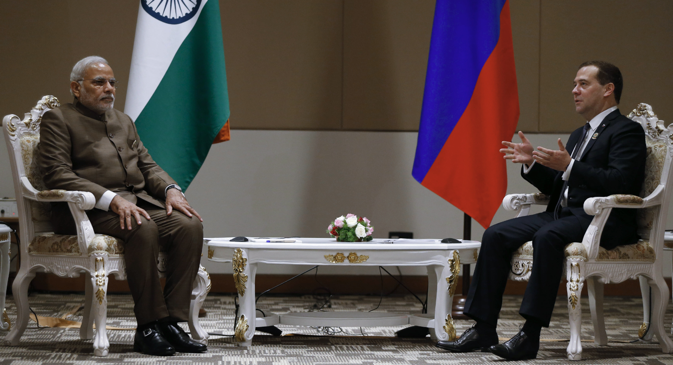 The two leaders, who met on the sidelines of the East Asia Summit, discussed cooperation between Indian states and Russian regions. Indian Prime Minister Narendra Modi met his Russian counterpart Dmitry Medvedev on Thursday in Myanmar’s capital city Nay Pyi Taw. The meeting was held on the sidelines of the East Asia Summit. “India is a close and valued partner for us,” Medvedev was cited as telling Modi, by PTI. The meeting focussed on bilateral relations and next month’s Indo-Russian bilateral summit which will be held when Vladimir Putin visits Delhi. Modi told Medvedev that he was confident that the ties between the two countries would be strengthened, according to the news agency. While recalling his visits to Russia when he was the chief minister of Gujarat, Modi called for greater cooperation between Indian states and Russian regions, according to the report, which added that the view was endorsed by Medvedev. Gujarat and the Russian region of Astrakhan have been actively cooperating in business projects over the last few years. Several Indian and Russian cities have sister-city agreements although this has not necessarily translated into increased trade. India and Russia are expected to release a “strategic vision” document at the conclusion of the bilateral summit on Delhi. Several economic agreements are ready to be signed at the summit. “I am waiting that on December 11 we will be able to attain new heights in terms of our relationship with Russia,” Modi was quoted by ANI as saying. With Putin skipping the summit, Medvedev is the highest ranking member of the Russian Government at the summit. He also held talks with US President Barack Obama and United Nations Secretary General Ban Ki-moon. Disputes over islands in the South and East China seas are figuring prominently in the summit. Russia has been cautious about making statements on the disputes since there is a clear clash with its growing business and strategic ties with China and its traditional and important friendship with Vietnam, one of the parties to the dispute. China has disputes with Japan, Korea and the Philippines, as Beijing claims complete rights over the South China and East China seas. Modi, in his speech at the summit, said all parties in the dispute should “follow global norms for peace.” Oil blocks offered to India’s ONGC by Vietnam in disputed islands have irked the Chinese leadership, as has the prospect of New Delhi’s military cooperation with Hanoi. At next month’s Indo-Russian summit, strategic analysts will be carefully examining the wording related to maritime disputes in East Asia.